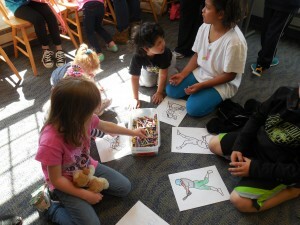 Kids color during Rhyme Time at MPL’s Mentor-on-the-Lake Branch. Whether you love Tiddlywinks, Rhyme Time, our Family Story Times or all of the above, you’ll be happy to hear that we have a full slate of story times scheduled for this summer at Mentor Public Library. Rhyme Time from 10:30 to 11 a.m. most Tuesdays at our Mentor-on-the-Lake Branch. Children from six months to five years old (along with a guardian) can enjoy songs, stories and a craft based on a special theme. Tike Time from 11 to 11:30 a.m. on Thursdays at our Mentor Headlands Branch. Kids from six months to four years old (with a big person) can sing songs, listen to stories and rhymes, and make crafts. Preschool Story Time, which takes place on Tuesdays and Wednesdays at 11 a.m. at our Main Branch. This is for kids from three to five years old. Children are expected to sit in the story time without a guardian. Tiddlywinks, which happens every Tuesday, Wednesday and Thursday at 10 a.m. at our Main Branch. These story times are for children 36 mos. and younger, accompanied by an adult. Mother Goose on the Loose story times, which take place on Friday mornings at 10 a.m in the Read House. There are two separate, 4-week sessions: June 12-July 3 and July 10-July 31. These are for children, 36 months and younger, accompanied by an adult. This story time (unlike our others) requires registration because of limited space. Family Story Time, which takes place on Thursdays at 7 p.m. and Fridays at 11 a.m. at our Main Branch and 7 p.m. on Monday at our Headlands Branch. This is for all ages with crafts and stories that are also used in preschool story times. During summer reading, our Thursday evening Family Story Times will be dedicated to Community Heroes like police officers, firefighters and teachers. A nurse will hold a Teddy Bear Clinic during our first Community Heroes story time on June 11. Also, if you want to know what books we read during our summer story times, we post them on our website so you can re-read them to your child later. Finally, we have several super programs scheduled this summer from Marvelous Mondays to celebrations of literary heroes like Pete the Cat and Junie B. Jones. For more information, check out Mentor Library’s online event calendar. And while your family’s here, they can sign up for summer reading. This entry was posted in Uncategorized and tagged Mentor Public Library, story time, summer reading. Bookmark the permalink.